I have an 88 acura that has overheated once again. This time it blue the head gasket. I'm reassembling it now, and I come to discover that I may have had the valve timing wrong from last time. I don't have any manuals. The only documentation I can find says to line up the marks on the cam pulleys (obviously), and then attach the bottom halfof the timing cover and the crank (accessories) pulley. Then check the little "white mark" on the pulley. It should line up with the plastic pointer on the timing cover when at TDC. Really? This seems kinda silly and a real pain in the neck. Okay, there is no white mark on the rusty old crank pulley. However, thereare a few tiny notches "chiseled" into it. One of which looks like it might be painted red. The others could be construed as ignition timing marks because they occur several degrees before the red notch (assuming the engine spins counter-clockwise when facing the timing belt, which I believe it does). Now, several degrees (maybe 10-20) clockwise from all the notches on the crank pulley is the actual key-way. 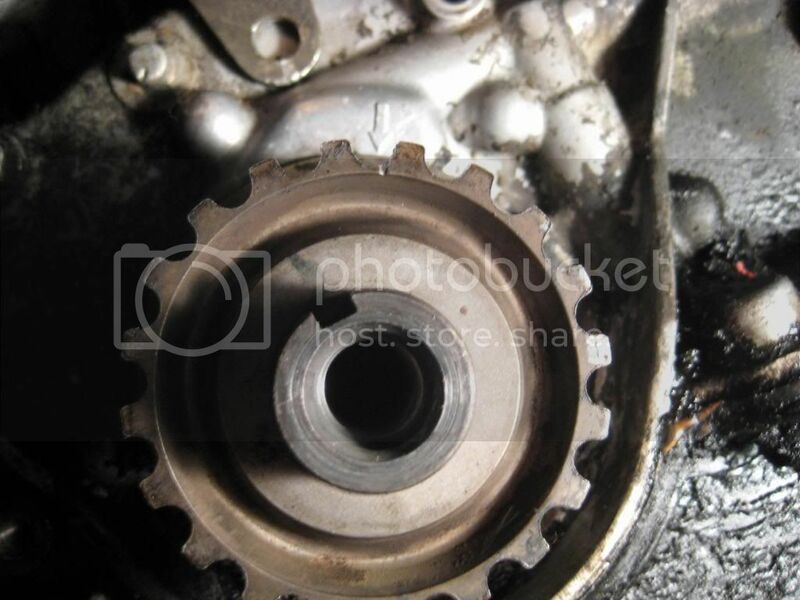 Furthermore, there is a single small dimple/notch on the crank timing belt pulley itself. This dimple is several degrees farther clockwise from the key-way. Does anyone know for sure what all the this means? Does the key-way play no role whatsoever in setting TDC? 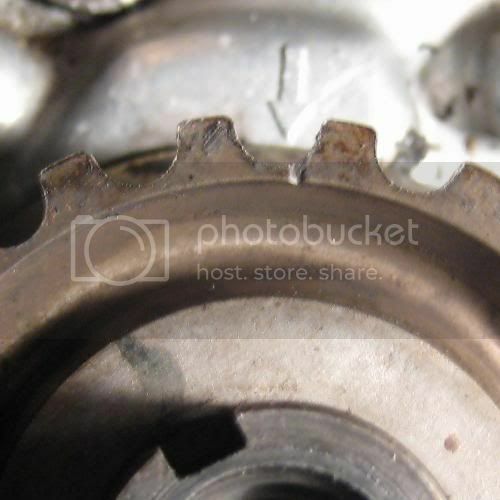 What about that dimple/notch on the crank timing belt pulley? It seems odd that the key-way is not used, since the cams, distributor, andcam sensor all have some type of key-way that points up when at TDC. But not the crankshaft? Anyway, I intend to follow the only documentation I have, and line up that red mark on the crank accessory pulley with the plastic pointer on the timing cover. It is in the neighborhood of TDC when eye-balled with the pistonitself. Re: What's the definitive answer about lining up timing marks on the crank pully? > up when at TDC. But not the crankshaft? center hole. This is what lines up with the keyway in the crank. into the oil pump. These both MUST be visible, and they MUST match. center hole, then you've got the wrong pulley on there. > on the timing cover. notches and put some Wite-Out on them, so they are easier to see. > with the piston itself. off (easy to do!!!) and you'll have all kinds of problems. Re: What's the definitive answer about lining up timing marks on thecrank pully? > > up when at TDC. But not the crankshaft? > center hole. This is what lines up with the keyway in the crank. > into the oil pump. These both MUST be visible, and they MUST match. > center hole, then you've got the wrong pulley on there. > > on the timing cover. > notches and put some Wite-Out on them, so they are easier to see. > belt cover goes on. > > with the piston itself. > off (easy to do!!!) and you'll have all kinds of problems. Thanks for the advice. After wiping away a bunch of sludge behind the crankshaft timing belt pulley, a little arrow on the block revealed itself. The arrow lined up with the little notch on the timing pulley when at TDC, as measured by a dial indicator on the piston through the spark plug hole. Ironically, the crank accessory pulley is really confused about what it's trying to tell. I did find a little dab of white paint, but it was easily afew degrees off from TDC when checked against the timing cover tab. Also, the notches in the pulley you mention were strange, too. I figured the three notch cluster was for ignition timing. But, there were actually two other notches some ten degrees or so clockwise from the first three. One of the notches (the fainter one) lined up nearly perfectly with TDC. Theother one (the big one) was doing who knows what. I added some more whitepaint to the accessory pulley where true TDC is. It's all back together now and seems to be running well, except the timing belt still seems a little loose. It jiggles when the engine is running. Is there an easy way to tighten it once it's all back together? I can't seehow without pulling the cover off again. But why is there an access hole for the idler pulley bolt in the timing belt cover? timing pulley you're showing is from a '96+ engine. That hole is so you can tension the belt properly. 1) what method did you use to tension the belt? 2) how much slack is there in the belt? pulley to the intake cam. what is the observed deflection at the middle of the run? > timing pulley you're showing is from a '96+ engine. > That hole is so you can tension the belt properly. > 1) what method did you use to tension the belt? > 2) how much slack is there in the belt? > pulley to the intake cam. > what is the observed deflection at the middle of the run? I seem to recall we just applied what pressure we could on the tensioner and tightened down its bolt. It seems as though the tensioner's spring is supposed to take up the slack, but it did not seem to. It seems as though I should be able to make the belt as tight as I can between exhaust cam and cranshaft, then let the tensioner's spring take up the slack on the water pump side. One other issue is that the tensioner is attached to a little bracket with a hole. The hole must fit into a little dowel sticking out of the block. It wants very badly not to stay in that hole when being tightened. It tooktwo people to get the tensioner bolt tight. One to ensure the bracket stayed in the dowel, and the other to tighten the bolt. Here's the expanded pic from before, showing the bracket hole in the background, and the dowel I mentioned. As for the key, there are thin anodized flange spacer things that go on either side of the crankshaft timing belt gear. The one on the outside of thegear is not shown here. Then there's the little key that goes into the key-way on the outside of that flange. It loves to fall out, so it's not shown here either. Only when the pulley is ready to install do I insert the flange and the key. It's too difficult to measure the play in the belt at the center with everything together. I'd estimate it's a good inch though. It certainly seems to jiggle about an inch when the engine is revved. I don't see how it can be tightened without pulling off the bottom half of the timing cover again. I'm not sure if it's doable just by pulling off the tire and accessing the crank and tensioner bolt though. I'm afraid that tensioner bracket will fall off the dowel if I loosen the tensioner bolt enough to allow it to be adjusted. It was very precarious on that dowel until the bolt was fully tightened. I'll probably be pulling off the bottom timing cover this weekend to see ifI can get that belt tighter. The way it jiggles now makes me nervous to take it much beyond 2500 rpm. > &gt; &gt; plug hole. > &gt; timing pulley you're showing is from a '96+ engine. > &gt; &gt; belt cover? > &gt; That hole is so you can tension the belt properly. > &gt; 1) what method did you use to tension the belt? > &gt; 2) how much slack is there in the belt? > &gt; pulley to the intake cam. > &gt; what is the observed deflection at the middle of the run? > I seem to recall we just applied what pressure we could on the tensioner and tightened down its bolt. It seems as though the tensioner's springis supposed to take up the slack, but it did not seem to. It seems as though I should be able to make the belt as tight as I can between exhaust camand cranshaft, then let the tensioner's spring take up the slack on the water pump side. > One other issue is that the tensioner is attached to a little bracket with a hole. The hole must fit into a little dowel sticking out of the block.It wants very badly not to stay in that hole when being tightened. It took two people to get the tensioner bolt tight. One to ensure the bracket stayed in the dowel, and the other to tighten the bolt. > Here's the expanded pic from before, showing the bracket hole in the background, and the dowel I mentioned. > As for the key, there are thin anodized flange spacer things that go on either side of the crankshaft timing belt gear. The one on the outside of the gear is not shown here. Then there's the little key that goes into the key-way on the outside of that flange. It loves to fall out, so it's not shown here either. Only when the pulley is ready to install do I insert the flange and the key. > It's too difficult to measure the play in the belt at the center witheverything together. I'd estimate it's a good inch though. It certainly seems to jiggle about an inch when the engine is revved. > I don't see how it can be tightened without pulling off the bottom half of the timing cover again. I'm not sure if it's doable just by pulling off the tire and accessing the crank and tensioner bolt though. I'm afraid that tensioner bracket will fall off the dowel if I loosen thetensioner bolt enough to allow it to be adjusted. It was very precarious on that dowel until the bolt was fully tightened. > I'll probably be pulling off the bottom timing cover this weekend to see if I can get that belt tighter. The way it jiggles now makes me nervous to take it much beyond 2500 rpm. I was able to tighten the timing belt by just removing the tire and removing the power steering pump and bracket out of the way. I loosened the tensioner bolt about 180 degrees. Just enough that it seemed sufficiently loose, and hopefully not enough to permit the tensioner bracket from slipping off that dowel. I turned the cranshaft counter-clockwisewhile holding the exhaust cam in place with a wrench. I held pressure on the crank to keep the belt tight between the crank and exhaust cam. Then, while holding the belt tight between crank and exhaust cam, I tightened up the tensioner bolt. After removing the cam wrench I turned the crank a few revolutions, and thebelt is definitely tighter now. I'd estimate it now has about a half inchof play at the center of the run between crank and exhaust cam. With the engine revving, the belt hardly jiggles now. Maybe just a slight vibrationit noticeable near the center of the run at higher rpms. I'm much happierwith it.